It’s a homecoming of sorts for me. 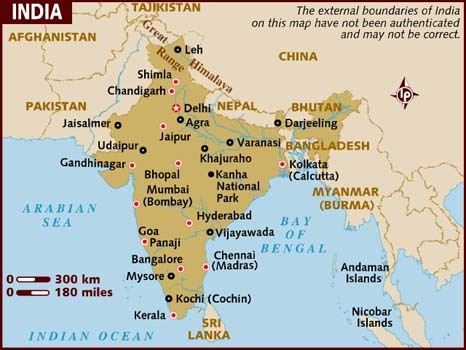 I was born in the city of Chennai (look at bottom right of India map) and lived there for 9 years before moving to the U.S.
My friends and I landed in Bangalore and stayed there for a few days before heading off to Mysore. A typical India travel blog post is generally a reflection on new experiences, sights and smells. For me however, it’s more of revisiting my past and reliving certain aspects of my old Indian life. Even though NC is now my home, there are parts of me that just fit in seamlessly into Indian life and culture. I’m not phased by things that others are. Ahh yes, the infamous Indian traffic – no stereotyping on this one. Traffic rules are just mere..err guidelines. Cars come too close. Motorcyclists weave in and out of traffic at alarming speed. Blind turns exist everywhere. Honking is a necessity, not a sign of annoyance. Every few minutes, it looks like an accident is JUST about to happen, but magically, no it doesn’t. One of my friends shuts her eyes tight and prays that we will come out alive after each car ride. It’s funny for me to watch that. I look at it with a big MEH. I trust the drivers. No one actually wants to die or cause an accident. They got places to be and a billion people to fight through. Traffic rules? PSH. AIN’T NO ONE GOT TIME FO DAT. I grew up eating Indian food and it’s still a part of my diet in the U.S. A lot of tourists in India are cautious and many do get the runs. SO CURRY. MUCH SPICE. I however, am thrilled. I’m happy to be here and eat. Granted, I’m fortunate that my stomach is quite good with travel (great, I probably just jinxed myself). I get to eat Indian food AT ITS SOURCE YYAAAASSS. I’m mostly drawn to street food. As a kid, I always wanted to eat the fried, greasy, and tangy street food but wasn’t allowed to. I still have that in me. Give me a stall where a man is frying things in questionable oil – I’M THERE BABY. I’m currently stopping myself because it IS possible for me to get ill, but MAN I LOVE INDIAN STREET FOOD NOM. I have mostly been eating home cooked Indian food with no complaints as YAY I’M INDIA I LOVE INDIAN FOOD YUMMY. 3. OH MAY GAH, A COW. I feel like this is one of THE visions of India that everyone has. And yep, it’s true. There are cows that just wander in the street. They are mostly not stray. They typically belong to a family that supplies neighborhoods with milk. The city of Bangalore is strict on not allowing cows to wander in the city. However, Mysore is more laid back. My friends are excited about seeing the cows. Again, I’m pretty chilled out about it, although I find the animals strangely comforting. 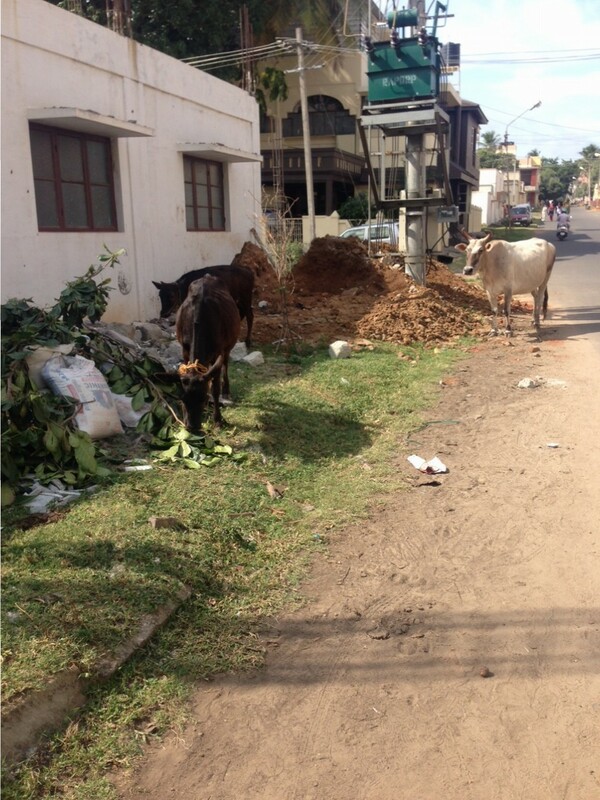 Here you go, a requisite picture of cows on the street. See, those are things I’m not phased by and adjust to right away. But, I wasn’t fully prepared for the nostalgia that hit me when I got here. Seeing school kids in uniforms, families riding scooters, drinking South Indian style filtered coffee, traveling by train, the smells of the streets, the honking, the sounds of your neighbor’s pressure cooker whistling – it’s familiar, comforting, and sad all at the same time. I am well aware that I’m looking at things with a rose-colored lens. I’m here visiting. I don’t have a life here anymore. I know that there are many frustrations in this country that Indians have to content with such as non-standard infrastructure, frustrating traffic, dust, heat, and so on. But, despite it all – I feel a sense of deep grounding when I come to India, especially the South. This is where I am originally from. Growing up, my parents and I lived with my grandparents. The connection to my grandparents is palpable and THAT makes it feel like home. I am really happy to be back and am extremely grateful and proud of my childhood memories.